Set up the first clinic at Hougang at year of 2002. Our physicians are qualified and registered with the Ministry of Health, Singapore. The Clinic provides Traditional Chinese Medicine treatments, acupuncture, therapeutic massages etc. All our herbs and products are approved by the local authorities. Our therapy, which is 100% herbs, is designed to bring maximum benefits to customers like you. 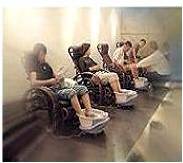 With regular use, it improves blood circulation, increases metabolism, eliminates the body wastes and toxins. Our herbal therapy is effective for the treatment of muscular-skeletal injuries, problems associated with respiratory and circulatory systems such arthritis, bronchitis, rheumatism, sinusitis and any other conditions of the lung and body cavities. The Green Leaves Herbal Foot Spa Therapy is so well accepted now, young and old, near and far. At the invitation of the Hong Kong press, Mr. Norman Ko flew into Hong Kong to share his results and concept with the public.